"We sat by the fire and ate a goat." I can't stop singing that to my wife. She doesn't like it much. I've not heard the new album enough to have strong feelings about it either way, but my initial reaction fits right in with everything you said. I liked its sound. There's some polyrhythmic Beefheartian echos, and I think the voice is strong. Also dig all the horns although I still miss the great Ralph Carney. It doesn't really grab me right away lyrically. "Hell Broke Luce" sounds awesome, but I thought the lyrics were pretty goofy...that's the song I skipped to in the car the other day when I had time for only one though. I was thinking "anti-war" song all the way; meth never crossed my mind. 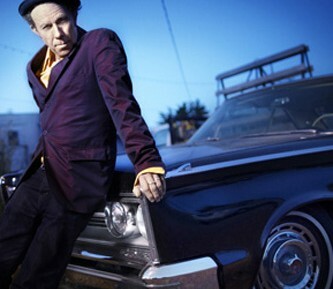 You're so right about Waits' freshness which is exactly what makes him my favorite musical presence. Here's a guy beloved by most music people (maybe not so much regular people) who could get by doing the same thing over and over again. He could make 'Mule Variations' from now until the day he decides to retire and people would be fine with it, but he doesn't. He reinvents himself. And I'm glad that as much as I like the challenge of 'Real Gone,' he didn't decide to make a second beat-boxing album. I HATE "The Road to Peace"...always skip over that one. It's one of the few Waits' tracks I'll reach for the button on. I don't even know if I can explain why. I do prefer "The Day After Tomorrow" even though I don't think he has to try all that hard to write a song like that. And you're right--it doesn't fit in with all the beat-boxing. But yeah, "Hell Breaks Luce" tops 'em both, easily. I liked the album even more the last time I listened to it. It's been in the car I don't usually drive, so I haven't heard it as many times as I would usually listen to a new Waits' album. Like to blast the mo-fo LOUD though! I was really looking forward to your thoughts on 'Kindergarten Cop'...oh well.